Even the best digital camera on the market today has lots of limitations, the professor behind the prototype, Marc Levoy, tells NPR's Guy Raz. Say you want to take a photo of your child playing with a new toy in a dark room, near a bright window. It's tough to do now because of the variations in lighting within that single frame. If Junior's face is visible and bright, the tree and the sky through the window will be bleached out. If the scene outside comes out just right, Junior will be so underexposed you won't be able to see the glee on his face. Not so with the Frankencamera, says Levoy. 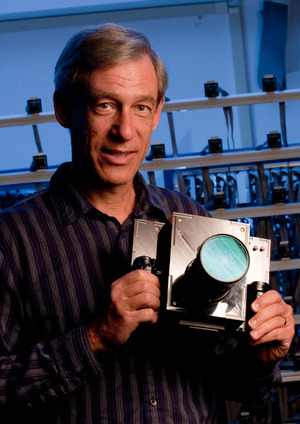 For the prototype, he and his colleagues developed a program that instructs the camera to take two rapid shots if a frame has both dark and light parts. One shot exposes correctly for the dark; one shot exposes correctly for the light. The program then merges the two images into one, taking the best parts from each. And what if a camera could do the same thing for focus — take three shots, focusing on different things in each frame, and merge them into one crystal-clear shot? According to Levoy, these are just a couple of examples of how programmers could change the future of photography with the Frankencamera. The key is that the camera uses a Linux operating system. All digital cameras are essentially minicomputers, says Levoy, and they can be modified a bit by the photographer. But the manufacturer determines what features are available. Linux is "open source," which means the camera owner can change everything about the electronic guts. Photography took an enormous leap about 30 years ago, after Willard Boyle and George Smith came up with the "electronic eye" sensor that allowed cameras to ditch film and go digital. Boyle and Smith won the Nobel Prize for Physics this past week for their work. But Levoy says that digital photography has not progressed as fast as it should have since then — and that's what he's hoping to change. Still, the Frankencamera is only a prototype at the moment. Presumably, it will become smaller and more elegant over time. But Levoy says his team is not planning to try to compete with Canon or Nikon. "Our goal is not to make a product. Our goal is to try and push traditional camera makers to incorporate more of these flexible ways of producing images in their cameras." And, he says, their goal is to try to make 1 of every 5 of the photos you snap a keeper, rather than 1 in 100. But why can't you just take your pictures with a standard digital camera and fix them later in Photoshop? "Well, sometimes you haven't captured everything you need to capture to make a good picture," the scientist says. Levoy is the son, grandson and great-grandson of opticians, so he comes naturally by his interest in things visual. He imagines a future in which the camera is able to make adjustments that better mimic what the human eye is capable of. But the Frankencamera won't necessarily turn everyone into Annie Leibovitz. "The part that we're not automating is the part that's nine inches behind the lens," Levoy says. "You still have to be a good designer of photographs."